Join us for this very exciting presentation portraying the life and spiritual journey of Thomas Merton. 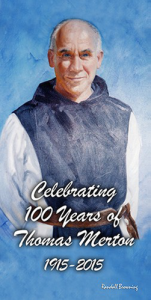 This year marks the 100th anniversary of Merton’s birth. Upstate NY Call to Action is most pleased to invite everyone to join us for this one-man, one-act play with actor and playwright James Nagle. See below for locations, dates and times. This one person play portrays the life and spiritual journey of Thomas Merton – his youth, conversion, monastic/hermit life and untimely death. We see the struggles, joys and challenges he embraced in becoming the deeply human monk, prophet, poet and spiritual writer God called him to be. Jim Nagle’s goal in life is to help people realize that they are loved unconditionally by God. How does he do this? Mainly through the arts and his life. This pilgrim and dreamer who hails from Cleveland, Ohio, has celebrated life as a teacher, a poet, a playwright, a story-teller, an actor and a clown (in all 50 states). He performs Thomas Merton: Alive at Fourth and Walnut: the story of the man-monk who just happened to be a spiritual giant of the twentieth century, and a very human being. Nazareth College Center for Spirituality. The Spiritual Renewal Center, Syracuse NY. “Thought I would give you an update from our prayer service last night (May 22nd in Binghamton). We had a very supportive turnout of 110 people. A very good representation of the Women Religious from our area, the Sisters of St. Joseph, Daughters of Charity, and Benedictine. Everything just flowed beautifully with the various readings, songs, and prayers. Our 2 speakers, Sr. Donald Corcoran and Amy Fleming, were exceptionally moving….. We invited all the Women Religious to stand and they were given a very strong applause of support. The feedback continues to be coming in with comments of gratitude and how moved people were with the whole service.